Part of the South Coast Deer Fence project was about regeneration of the ground. It was possible, with the deer gone, to help accelerate that process and bring the land back into use. These projects were managed by the crofting townships and individual crofters, and funded through ALPS. A series of ditching and drainage projects were undertaken, reseeding of unused ground, planting of bee friendly hedging and extensive bracken spraying. In excess of 2,000 trees were given away to crofters, and planting took place throughout the area. 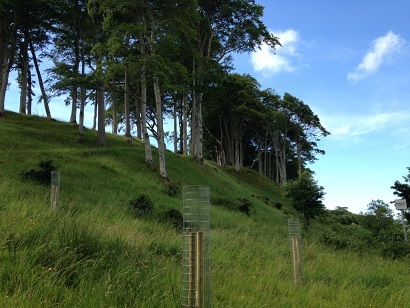 Milltown Crofting township embarked upon planting of 8ha of broadleaf woodland under the ALPS scheme. In all, an extensive scheme of regeneration and restoration was undertaken took place within the newly deer fenced southern end of the Applecross peninsula. This will help accelerate a regrowth and habitat regeneration, better use of crofting land and planting of new woodland. In 15 years, the area within the deer fence should be a very different place if managed correctly.